Help develop fundraising opportunities to strengthen the JEC community. The decision was made to change the next Education Committee Meeting to AUGUST 27TH 9:30-11:00. More involvement of teachers in the Ed Committee. A need for clarification on if students are expected to continue at SJS and Kadima if the BM is during the school year. Involve parents from this past year who have had a BM in the model service family education day. Online resource for sample services for kids to see as well as parent resource to understand pieces and parts of the service. Torah study for kids on Saturday? Add to BM packet expectation of all Kadima students post BM. The 2nd semester of 5th grade year should be the time to introduce Project Chesed and decide on BM date with the Rabbi and Jessica. Create a “What I did Today” sheet for each student to take home after every SJS that says what the student learned and 3 questions to ask your child on the way home. Friday, December 9th 9:30-11:00 A.M.
a. Set schedules that met every other month in a timely, fun 90 minute model. g. Board representation at all Education Committee meetings. a. Have each of the 6 subcommittees meet 2x between Education Committee meetings. a. Add a security committee? b. What is the protocol for students who have had their Bar/Bat Mitzvah? Do they continue in Kadima on Wednesdays? d. Creating an online platform for parents to chat. Facebook, Shutterfly or individual website? a. We revisited the Education Committee Visioning poster made at the beginning of 2016 to see how we did in achieving our goals and where we would like to focus for the next year. Contacting families with a survey monkey review and invite to Sukkot and Simchat Torah. Had meetings with all 7th grade families- waiting on 4 dates. Teachers have already been informed and are beginning to think about what they would like to do for a presentation. Asking food service oriented family to be in charge of baked goods and lunch. Jessica led us in a text study about Moses, leadership and the need for everyone to contribute in meaningful ways. Jessica went over the SJS goal of 50 students beginning in the fall and broke down how many anticipated returning (31) and new (15+) students we have as of August 10th. Registration- All students and families who participated in SJS or Kadima last year were automatically reenrolled and emailed their filled out registration information. New families have a link they were sent from the temple website. Richard shared the JEC budget and explained the anticipated revenue is based on 40 students in SJS. Therefore the deficit for the JEC budget will be less as more students register. Cathy Joseph and the Education Committee are hosting the SJS opening day breakfast. A sign up sheet will be going around to Ed committee members to contribute. Hinda Diamond has agreed to run our first parent hui meeting of the year after Boker tov on opening day. This is essential as we are anticipating at least 5 new families to join the JEC. Shabbat in a bag- each week a different SJS family will go home with a canvas bag that contains all the necessary supplies to have Shabbat at home. They will conical their experience, sharing feelings, experiences and tricks of the trade for the next family to learn from. Bar/Bat Mitzvah- Jessica has created a Bar/Bat Mitzvah handbook for the anticipated 20 celebrations this school year. This will streamline the process and help families be as organized as possible. Her and Rabbi Ken will also be holding a special Saturday morning family education for the 6/7th graders and their parents that will be a way to unlock the mystery behind a Saturday morning Shabbat service. Gan and JEC-Robyn and Jessica have been working very closely the past few months to create a bridge between the Gan and the JEC. Contact information and leads are passed to each other constantly. Friday, June 10 9:30-11:00 A.M.
a. Jessica lead the group in a text study looking at why the Book of Ruth is read on Shavuot. i. Jessica shared that the JEC gave teacher appreciation gifts to both the SJS/Kadima teachers and madrichim as well as the Gan teachers and assistants. i. Under the new Gan Director, Robyn Israel, lots of great things are happening. 1. Robyn is working very hard to put new systems and standards into place for the Gan and the Gan staff. 2. She is working on getting bulk supplies such as organic snacks and sunscreen. 3. Robyn is also working on an Amazon wishing tree list for the items the Gan needs. This will go up once she has finished going through and cleaning out all Gan areas. i. We determined the goal of the parent hui is a chance for parents to connect. That being said it was important that these events are more than a meet and greet and perhaps even have some learning involved. Jessica, Akiko and Elila will be working together to come up with program ideas for the fall. i. The summer program for the JEC is set for the week of July 25th. We need 10 students in order to run the program. So far, 3 have signed up. More information including a parent packet will be sent out in the next week. i. We are changing the Bar/Bat Mitzvah program to include a mitzvah project called “Project Chesed.” The families will meet with Jessica Bram and work together in choosing, planning and documenting their Project Chesed (their Bar/Bat Mitzvah) project. This project will be out in the community and relate to the student’s interests and even their Torah portion. Friday, April 8 9:30-11:00 A.M.
Jessica and Cathy welcomed everyone to our committee meeting and Jessica guided the committee through a text study focusing on the importance to look at everything (even the Torah portions we read each year) with a fresh set of eyes. 11 potential new member families interested in JEC and preschool captured. 20 new temple eblast recipients. celebrate teachers on May 15th! 5. Look for parent hui meeting dates in early fall! 1. Robyn Israel accepted job offer and will be officially starting May 15th. Click here to see the full Gan report. 2. Monday-Thursday will be from 9:00-3:00. Friday from 9:00-Saturday 9:00. 3. Flyers and more information will be available soon! 1. Rolled out the project Chesed plan for the following year for all Bar/Bat Mitzvah students. packet for families with upcoming Bar/Bat Mitzvah students. 1. What is the goal of the education committee? A. Safety concerns and a need for ongoing oversight brought to the table. B. Subcommittee potential to be added as a 7th committee? In attendance: Hinda Diamond, Julie Levitt-Guren, Todd Devere, Jackie Foil, Jessica Bram, Madeleine Hill, Malori Anthony, Diane and Gerald Umeda. 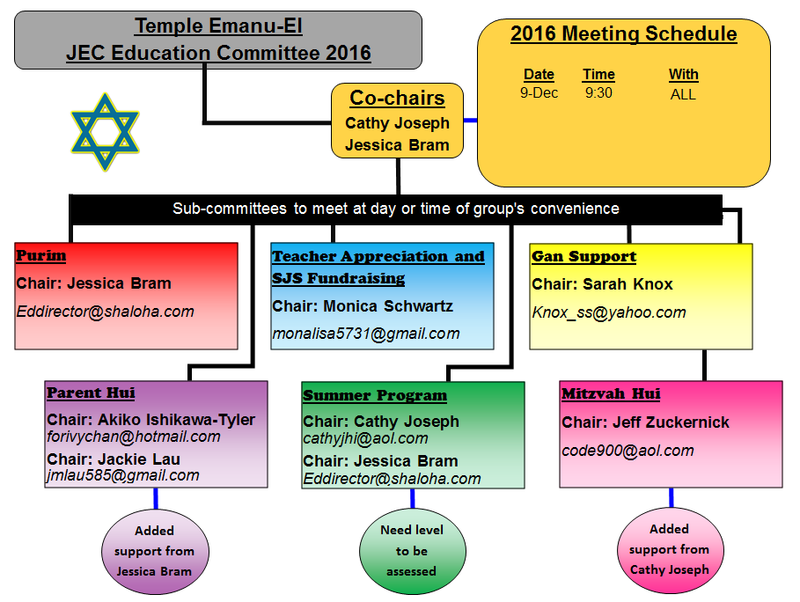 This year, encouraging subcommittees to meet on their own, create goals and figure out what we can do to help. Do members have their own goals to include? Should we do a survey to see what would encourage parents to attend? Is there a forum for teachers to get together with Ed Committee Co-chairs? When would that be? Maybe during the week or maybe at the very end of the day. Should Jessica come to parents Hui and brief parents on curriculum? Are public schools talking about it? Should there be discussion about openness about Jewish identity? If they raise questions, how do the SJS/Kadima teachers answer? Jessica - goal for JEC is Jewish identify building. Should something about anti-semitism/pride of heritage be woven into curriculum? Call around to public/private schools and discuss WWII and how anti-semitism began?? Attendance has been OK - Jessica wants to celebrate when students show up, not penalize them when they don’t. * 6th/7th grade students will need to have a parent with them if they are working. * Discuss jewish identity/anti-semitism at SJS at next Parent Hui?? * B’Nai Mitzvah parents helped polish the floor, paint walls, donated torah dressing. Next meeting scheduled for 11:30 to 12:30 on Apr. 2. Pastries at 11. Greetings from the Jewish Experience Center Education Committee 2016! We are your new co-chairs, Cathy Joseph and Jessica Bram. With a new year, comes new and exciting opportunities. Join us for one meeting, several meetings, all our meetings, anything is OK with us. We would love to see your face and have your input. Currently, we have six active subcommittees that have more flexibility with their meeting times. Feel free to reach out to any of our chairs and get involved! To keep you informed, we will be posting our agenda notes following each Education Committee meeting. This level of transparency and collaboration is meant to keep everyone informed throughout the year. Additionally, we will have subcommittee reports posted in brief to share what these groups are doing. We have had two active groups since the onset of the year. Please refer to the notes below. Our Purim committee is hard at work creating a fun, well organized, quality event that is open to the public. Our carnival is Sunday, March 13 from 10:00-2:30. We will be using the parking lot to showcase our big attractions (castle bounce house, dunk tank, Sumo suits, inflatable obstacle course, petting zoo, Kona shave ice truck, balloon twisting and much more), the courtyard will be used for the midway games and the social hall for food. Parking will be offsite at Maemae elementary school just down the road and shuttles will be provided. We could use your help during the carnival! Please contact me if you are interested in volunteering the day of. Also, bring your friends and family and your friend’s families! We will be making from scratch and selling hamentashen this year. Pre-order forms will be going out Monday. I need help baking. Please contact me if you are interested. Objective is to hire a highly qualified Director for The Gan Yerushalayim with a projected start date in May 2016. Richard, the Temple’s Executive Director, advertised the position on a number of job sites and screened all resumes. The search committee met to create interview groups and clarify the job description (see attached). Qualified applicants were offered a first interview on February 19th with the lay personal on the search committee. Three candidates who met qualifications were offered an interview. Of those three, two have withdrawn for various reasons. Those applicants who pass the first interview will be offered a second interview with Richard, Jessica, Momi and a teacher from the Gan. Those applicants who pass the second interview will be observed teacher a class at the Gan. References will also be checked by Richard.